A Network card is a piece of computer hardware that connects a computer to a computer network as well as Local Area Network (LAN). A network card is also known as a Network Interface Card (NIC). A network interface card provides the computer with a dedicated connection to a computer network. Most personal computers and workstations typically already included a network interface card for connecting to a wired RJ45-based network connector. The integrated network interface card usually works well for basic network traffic requirement with a wired connection. 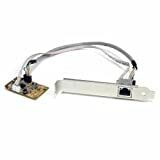 However, in some situations, you might need an additional network card for connecting to a Wireless network or for high-speed network connection demanding. Please check out these 5 best network cards that will fulfill your needs. Firstly, Rosewill is a company that doing well for customers in the products of computer peripheral devices. There is no exception with this ethernet network adapter. This Rosewill ethernet network adapter features dual gigabit ethernet ports allowing you to connect to two different physical LAN at the same time. This NIC using PCI Express single-lane (x1) with specification revision 1.1 that support throughput rate up to 2.5 Gbps. This NIC works with all network connection including 10/100/1000 Mbps. It meets the standard of IEEE802.3, IEEE802.3u, and IEEE802.3.ab. Next, If you want to connect to the Wireless Network (WLAN) with confident, This TP-LINK TL-WDN4800 is a perfect choice. With this wireless network card, you will get a dual-band N900 PCI network adapter (450Mbps at 2.4GHz and 450Mbps at 5.0GHz). 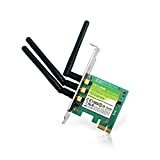 This TP-Link wireless network card has three built-in antennas with wireless connectivity improvement compatible with all wireless standard 802.11 a/b/g/n and works well with Windows operating systems from Windows XP 32/64-bit to latest Windows 10 32/64-bit. This product included a 2-year warranty and unlimited technical support. This StarTech ST1000SMPEX Ethernet network card features a compact and separated circuit board form factor fits in many Mini-ITX cases. This network card support many great features including NDIS5 checksum, Large Send Offload support, Wake-on-LAN and Remote Wake-up, jumbo frames and VLAN tagging. This StarTech NIC using a Mini PCI Express for maintaining the high-speed gigabit connection including 10/100/1000Mbps. This network card is fully compliant with IEEE802.3, 802.3u, and 802.3ab. You can also feel confident with this product as the StarTech will provide you a 2-year warranty and free lifetime technical support. For desktops, workstations, and entry-level servers, this Intel CT PCI-E network adapter is more than adequate. With PCI Express I/O bus and latest technology for maximizing system performance combination will increase end-user productivity. This Intel network card has a single gigabit network port that can run at a highest available network speed of 10/100/1000Mbps. This network card also supports teaming and other advanced features you need for advanced network setup. Last but not least, this TP-LINK TG-3468 designed to fit all common network connection and speed for general uses. This network card has a small and compact design while including two LEDs for indicating network traffic. This network card support all highest available 10/100/1000Mbps throughput. It does support IEEE 802.3x, 802.1p, 802.1q standards as well. This card support on the major OS of Windows starting from Windows XP 32/64-bit. This TP-Link network card is a cost-effective and most affordable that is good for the most desktop computers. Those are the five top network cards that each of them is designed to meet specific needs. If you want a power network card with advanced features for workstation or server then Rosewill and Intel will be the best choice. For a wireless network, we recommended the TP-LINK N900. Hope you can find one that will fulfill your need for your network setup.